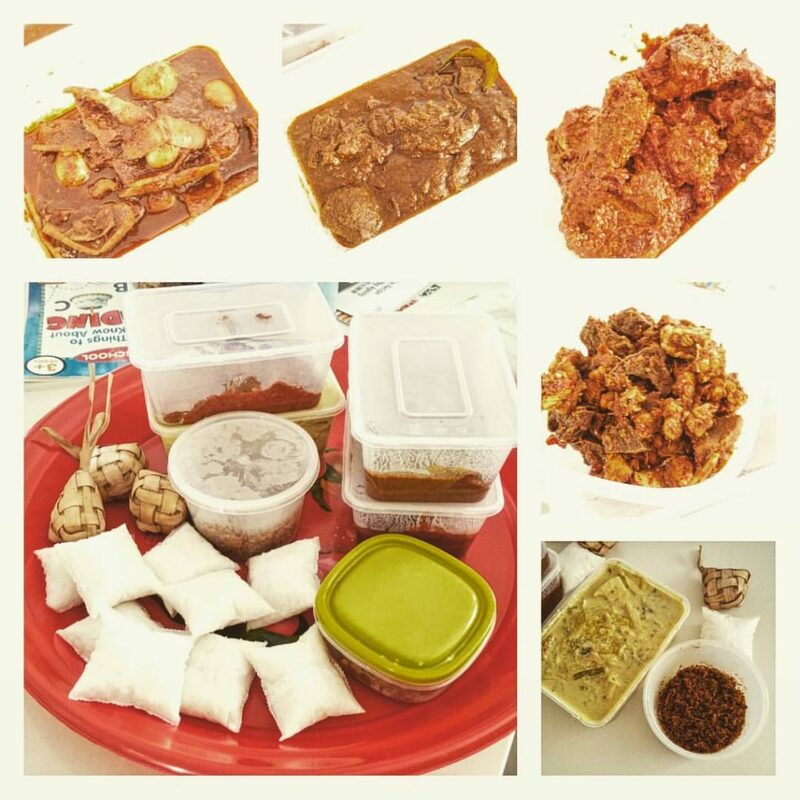 Firstly, let me rave about the spread my Muslim neighbour gifted me during Hari Raya last week. There was a beef rendang, an ayam masak merah, a longtong, a sambal sotong with quails egg, beef lung with tempeh and ketupat. I’m glad we have a great relationship with the neighbours. We have neighbours who watch out for us and we return the favour too. We have contact numbers so in case of emergency, we can just quickly call each other. Hahah, one of my neighbours actually call to tell me that my bedsheets flew off and that it was with her cos her hubby went to pick it up. So funny! But yes, that’s the kind of relationship with our neighbours we have. And I love it. As a kid, I lived with 13 people in a 4 room flat for a good part of my life before grandma and uncles moved out. During festivities, it was always filled with baking. There would be an elderly lady who baked really good kueh bangkit a few floors up and my mom would go pick up a couple of containers. Our neighbour one floor down would take us in if my mom was going to be home late. We had friends in the next block too, so that was another option if ever. I made sure that the kids know our neighbours too, who they can go to if they need help. I would take them along with me to the wet market when they were babies, so the vendors have watched them grow up. I was teaching Ollie about money the other day, and gave him some to go buy some soy milk. I watched him order his drink, hand the money over and then run off without taking the change. The vendor had put the money aside and waited for us to go back to her before returning the change. The hubby has been iffy about strangers and our kids but with these people that I ‘visit’ regularly, I have no qualms about letting the kids hang around them. It does make me feel that there is a community within our neighbourhood. Makes it more lively to be able to take a walk and say hi to someone you recognise. And all the sharing of the food too. Yummy. Me? I’m always making desserts haha. Hopefully, these gets translated down to the kids. That there are always people who will help if they are open. Kampung spirit ftw! Really love the kampung spirit that you have there! It really feels warm. Knowing our neighbours is the way to go for all of us. The food looks really yummy here! It’s so sweet right? I really need to get this kampung spirit in my head cuz I have a lot of wonderful neighbours, but I am a bit lacking myself? Most of the time I get really busy with my kids and when I finally get to sit down and have a breather, I really hate neighbours coming by to sit down and talk. 🙁 Hopefully we can strike a good balance soon! I saw your post on IG and got tempted to take a photo too of what our neighbor gave us but was too lazy. Haha! We also have very kind Muslim neighbors. They give us food even if it’s not Hari Raya and we also return the favor. I love and appreciate the kampung spirit because I grew up in a village. Love all the Malay food, making me crave for it now.. Kampong spirit is so rare, you are so blessed! It’s really a blessing to have great neighbours who look out for one another and definitely a bonus for 1 who shares good food. We are also quite blessed to have 2 very lovely families right next to us and helps that we are quite near in age so we hanged out plenty. WOW! I love how generous and sweet your neighbour is! Would like to have someone who would look out for us too! Eh, nice to see that kampung spirit is kept alive! I thought it was nearly extinct in Singapore, so it’s encouraging to know that there are places where doors are always open. Wow that sounds delicious!! Such nice neighbours u hve!